New Book: "Game Faces: Early Baseball Cards from the Library of Congress"
A new book, “Game Faces: Early Baseball Cards from the Library of Congress,” offers baseball fans and historians a visual delight that showcases early baseball cards from the 19th and early 20th centuries alongside photos from the early days of the nation’s beloved pastime. Author Peter Devereaux takes readers behind the scenes of the Library of Congress’ Benjamin K. Edwards Collection to see the vibrant world of the early boom of America’s pastime. “Game Faces” was published in October 2018 by Smithsonian Books in association with the Library of Congress. It is the first book to explore the Library’s extensive collection of early baseball cards, providing both the history and cultural context that reveals baseball cards as documents of their times as well as their teams. The book accompanies the Library’s ongoing exhibition “Baseball Americana,” which is open through June 2019. In the 1880s, more than half of the population lived in rural areas without major league baseball teams of their own. Since pictures were rare in newspapers, the only way these fans could follow the game was through the box scores and printed recaps of games. The new baseball cards, brightly colored and with precise detail, brought the legends of the game to life for people all across the nation. 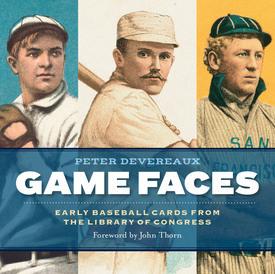 “Game Faces” not only highlights cards depicting many of the early stars of baseball like Ty Cobb, Cy Young, and Christy Mathewson, but also shines a light on the lesser known figures. “Game Faces” provides engaging insights into the players, the development of the game and American culture at the turn of the 20th century. Learn about the rich, engrossing history of the baseball card and the ways it has influenced and shaped not only baseball culture but American culture as a whole. “Game Faces: Early Baseball Cards from the Library of Congress,” a 155-page hardcover book with more than 300 images, is available for $19.99 in the Library of Congress Shop, 10 First St. S.E., Washington, D.C., and through retailers. Credit card orders are taken at (888) 682-3557 or online at loc.gov/shop/. The Library of Congress is the world’s largest library, offering access to the creative record of the United States - and extensive materials from around the world - both on-site and online. It is the main research arm of the U.S. Congress and the home of the U.S. Copyright Office. Explore collections, reference services and other programs and plan a visit at loc.gov; access the official site for U.S. federal legislative information at congress.gov; and register creative works of authorship at copyright.gov.